Our “vacation home” prior to hitting the road. When we first decided to ditch the sticks & bricks, and 90% of our possessions, for a life of wandering the country in an RV we knew nothing about what that would entail. We had owned a Starcraft tent trailer and camped extensively but that’s hardly like living in an RV. 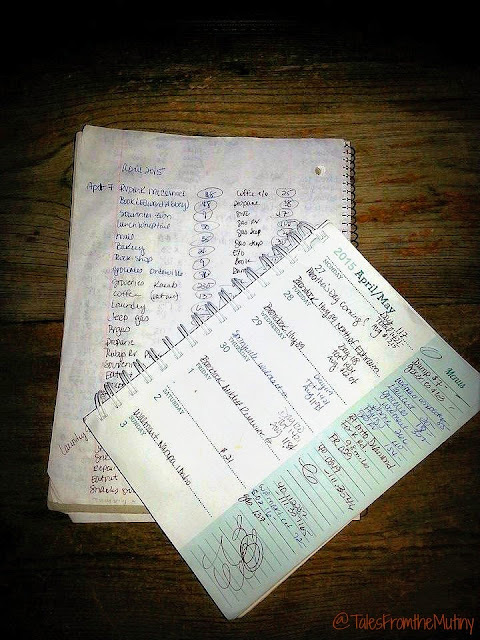 Of course, we did some research and gained a lot of knowledge from other people’s blogs on the logistics of things like how to get our mail, why we might want to change our domicile, how to find places to camp, etc. But we didn’t really understand all of the options available on RVs and what our needs might be, especially down the road. So, about a year and a half into our adventure, while camping at Glacier National Park with Jen and Deas from Nealy’s On Wheels, that we found out the Mutiny wasn’t equipped with an inverter (shoot, for 8 months we didn’t know we had Sirius/XM radio and that the previous owner had purchased a lifetime membership…these things can happen). 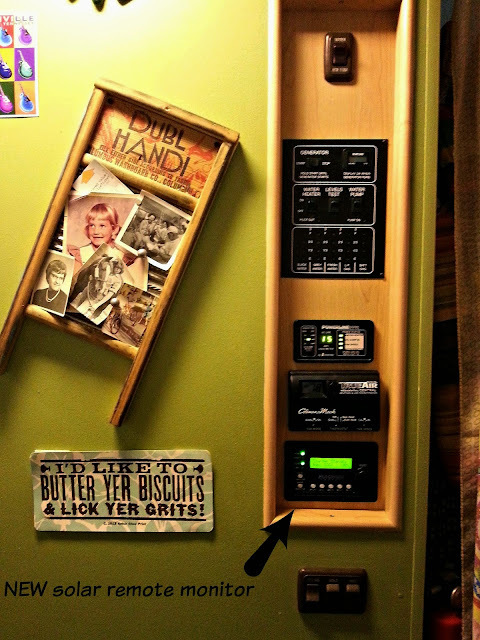 An inverter, unlike a converter, allows one to use the juice stored in your battery(s) to power up appliances inside the RV. 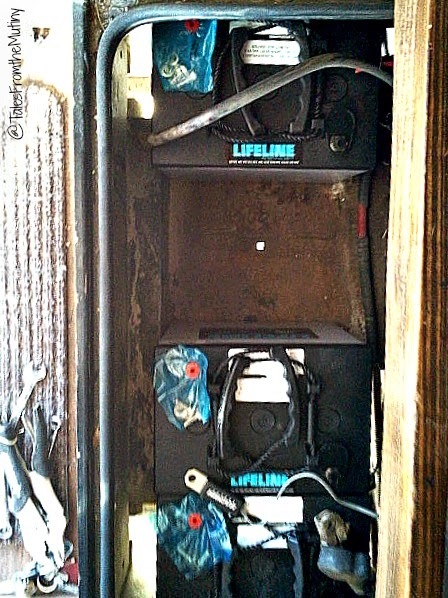 The battery(s) can then be “recharged” by either running the generator, running the engine or with solar panels. Without an inverter we could only run things that used 12v power like our lights and…well, our lights…that’s it. We saw how very limited we were in our travels. Sure we’d been to a lot of amazing places already and technically we were able to “make do” with our limitations…but we were sometimes opting to skip places or explore for just a single day because the drive to and from the full hookup RV park was too far. On top of that, some of the best places also offered cheap or free boondocking whereas private RV parks were able to demand exorbitant fees from us suckers who not only wanted to see all that beauty but also needed electricity. The seed for solar was planted. It would take several months of creative financing, research and scheduling to get the job done. First and foremost let’s be clear, we are not experts. We might be just smart enough about this stuff to make us dangerous. There are many, many resources on the internet that will explain how solar works, how to calculate your needs, how to install your own system, pros and cons of different panel types and everything in between. But we wanted to share a little bit of what we learned, what we had installed, how it’s working for us and what we’d do differently. So, here you go! 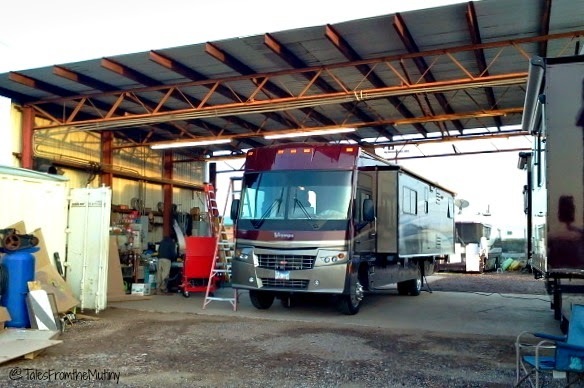 Parts were obtained from RV Solar Electric in Scottsdale, AZ and installed by D&R Family RV in Glendale, AZ. Note that, in our situation, we were starting off with NO inverter. A lot of rigs come with inverters installed from the factory so our expenses may be higher than many others. We also opted for the (much) more expensive non-maintenance 6v batteries because we know our history with taking care of those things. The Mutiny getting ready for the big install. 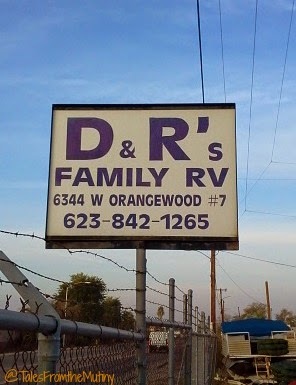 I did a crap-ton of research on installers and chose D & R Family RV based on that research. They are one of only five installers in the country recommended by JackDanMayer and their word was good with us. It was also a convenient location for us once we were ready to pull the trigger. Although we had little to no working knowledge of solar, Ron, of D & R, was able to take our needs and desires and build a system to suit our needs. He also helped us place our order for parts (D & R is an installer of solar…they do not sell the parts. But they do have a great working relationship with RV Solar Electric and can help newbies like us order everything needed). When we arrived the evening before our appointment Ron had a spot for us to park and plug in. As fulltimers this is a huge deal to be able to live in our RV while work is being done…and it was greatly appreciated. He also had every single part already delivered and on hand. Work was started early the next morning (about 8am) and we were serenaded with Christmas carols by our two technicians (our install was done the second week of December). There were no delays at all and the job was done in one day (and early enough for us to move on down the road to Picacho State Park). After seeing everything that was involved with installing all of the bits and pieces…drilling holes in roof and resealing it, threading cables and wires into places I had no idea existed, rewiring the fuse panel, adding the remote display seamlessly into our control panel, making batteries fit and warrantying all the work done we feel that the labor cost was worth every single penny. There’s just no possible way we could have figured it out. We also don’t own the proper tools to even attempt an install. But most importantly, we didn’t want to a) get divorced or b) end up killing each other trying to save 22% off of our bill. Besides, I’m pretty sure we would have spent much more than $1377 replacing all the things we would have broken in a fit of rage or blown up from lack of knowledge. Somehow that 4th battery is gonna fit. Reset Your Expectations: You’ll likely expect solar to do more than it can. 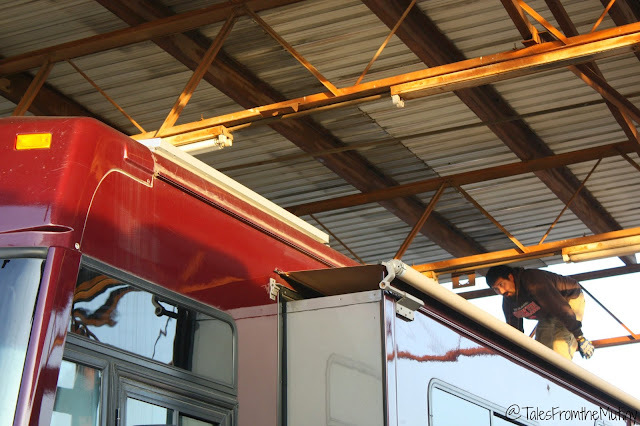 For most us, there is only so much space on our roof for panels and so much storage space in our bays for batteries. That means there is only so much power we can harness from the sun on any given day. In the middle of the day, when the sun is high and the batteries are charged, we can run pretty much anything we want without even touching our stored power. Our readout will remain at 100% charged even with the TV on, the laptop charging and coffeemaker brewing. But when that sun goes down?? Well, that 100% charge starts to drop. And, depending on what you’re running, it can drop fast. You can only use what you have stored and that has to last you the entire night…which means you have to have enough juice left to run ambient things like your fridge (even if you have it on propane it still uses some electricity), your heater (again, even on propane it uses some power), carbon monoxide detector and your battery monitoring equipment. Something is always “on”. No Air-Conditioner: Even with a hefty investment in additional panels (some of which may have to be stored somewhere and then deployed on the ground if you don’t have the roof space for them) and an arsenal of additional batteries you likely won’t be able to run your air conditioner(s). It’s just not going to happen…and don’t be like some people I’ve seen in forums who confuse the words “ac power” (meaning alternating current) with being able to power up an AC (meaning air conditioner). For a great explanation read Technomadia’s post The (Almost) Fantasy of Solar Powered RV Air-Conditioning, in the comment section you’ll see some solutions others have come up with for staying cool. Propane Needs May Increase (a lot): While it is possible to run an electric fridge and cook top on solar it will cost you some extra bucks. Since our RV was already equipped with a dual powered refrigerator (that we actually like) we had no problem keeping it and running it on propane while boondocking. We also have a 3-burner propane cook top which works well. But, if you have electric appliances you might want to look at this post from Technomadia. Chris and Cherie use no propane on their bus conversion yet still do a lot of boondocking. Just remember…regardless of your decision, there’s always a trade off. For us, it means having to keep tabs on and fill our propane more often, which can be a pain. The no-propane route would mean a much larger upfront investment (more solar panels, more batteries and, for us, all new appliances). There’s also a large and constant drain on those batteries, requiring some careful power management so as not to let your food go bad. Get to Know the Difference Between a Pure Sinewave Inverter and a Modified Sinewave Inverter: Confession: we didn’t. Well, that’s not completely true. I had read this great comparison post from our buddies, Gone With the Wynn’s but I didn’t quite grasp the whole concept. So when we got our solar installed it didn’t even dawn on me to make a point to discuss these pro’s and con’s with our installer. We did have a discussion with our installer about what we hoped to accomplish with our solar (this included the type of TV(s) we had, whether or not our fridge and cook top were propane, what our expectations were regarding our perceived power needs to run the TV and charge the laptop, etc.) and he accommodated us by suggesting, and installing, a Magnum 2000-watt Modified Sinewave Inverter. While this inverter saved us about $1000 over the Pure Sinewave version we found out the hard way that things like our beloved bed heater and brand new induction cook top were incompatible with the modified inverter. Bummer. All panels on full tilt at Indian Bread Rocks. You Almost Definitely Want the Tilt Hinges. When the sun is low in sky (as it is during winter north of the equator) being able to tilt you panels can mean the difference between needing to supplement your power with a generator and a genuine full charge. Learning to park your RV in a way to optimize sun exposure helps but tilting those panels is the icing on the cake. Research As Much As Possible: I know it can be overwhelming because I’ve done it. While I consider myself a fairly smart person electrical systems are definitely above my pay grade. With all those amps and watts and Ohms and volts…the modified and pure sinewaves…the mono- and polycrystalline, fixed and tilt, flexible and ridged solar panel options…it can make your head spin. But I think it’s important to at least attempt to understand some basics, read some articles, look at some blogs or find someone using solar and talk about how their system works. This way you can feel a little more comfortable with things before pulling the trigger on what might be the biggest investment you’ve made since purchasing your RV. Weigh the Costs & Benefits: There’s a bit of a misconception that installing solar is the best way to save money while enjoying the fulltime lifestyle. That may very well be, for some people. But for others, they might never get the opportunity to use their solar as much as they’d hoped. Let’s face it, whether you opt to DIY or pay a professional, solar is expensive. At $6100 and change it’s going to take a LOT of free camping for us to recover our cost. But having solar has actually revitalized our fulltiming experience. 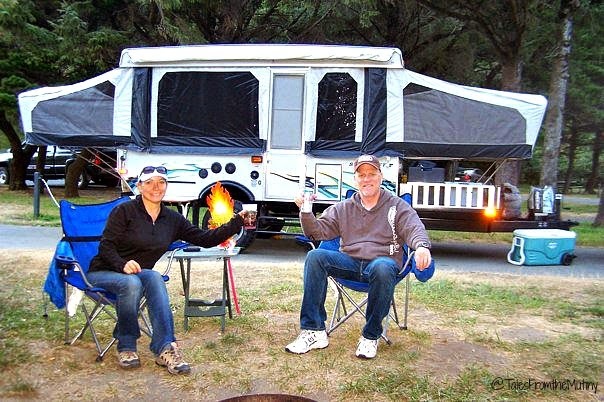 Truth be told, we were getting a little burnt out on RV parks and the stress of choosing one that was cheaper over a more expensive resort and risking, shall we say…unpleasant experiences. We prefer room to spread out, peace & quiet and nature over blacktops and crowded resorts. Adding solar to the Mutiny has improved our “quality of life” exponentially. Undoubtedly. But there are some people who thrive on social settings and love the RV resort life style. They want the ease of use…laundry facilities, swimming pools, hot tubs, game night, pot-lucks, firewood delivery and unlimited showers (okay, I do miss that part). And some people fall somewhere in between. Almost every single RVer we spoke to (or read about), made it clear that they chose to add solar for the freedom it gave them, not to save money. 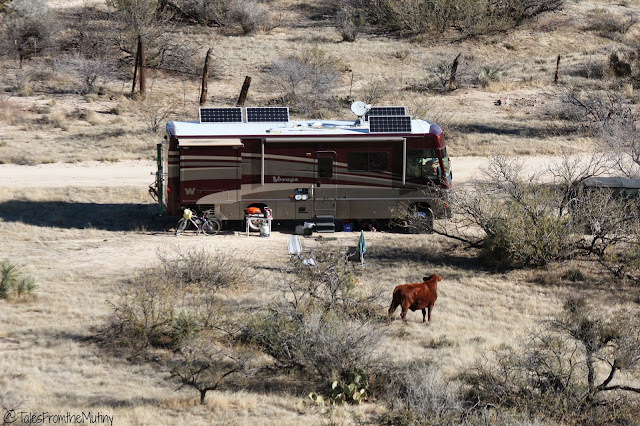 Crunching numbers…as of April 30 we were averaging $11.84 per night in RV park costs, after solar. That being said, prior to solar we had been spending $700-$900 per month in campground fees (we rarely were able to take advantage of monthly rates because we move too frequently). After solar, our average has been around $350/month. If this holds steeady, our savings would cover the costs in 10-18 months (give or take since we sometimes have a bigger propane expense when in the boonies but spend less on “sight-seeing”, eating out and impulse shopping when we’re close to “civilization”). But if it doesn’t, we’re good with it because the benefits we’ve experienced in just 5 months of solar use has already paid off. How It’s Working For Us: We couldn’t be happier. Seriously. Since January 2015 we’ve used our solar more than we’ve been plugged in. There has been a learning curve which has including learning how park to optimize our sun exposure, learning how to “save” our power, being mindful of our power usage, turning the inverter on only when needed and turning it off at night, that our TV is a power hog, our microwave barely runs on solar (we try not to use it all unless we can supplement with the generator) and that the trade-offs are worth it. What We Would Do Differently: If we had it all to do over again we would have gotten solar a lot sooner. And if money was no object we would have gone with a pure sinewave inverter.Of course, if money was no object we would also opt for more panels and batteries too. Future Plans: Now that we’ve been using our solar these past 5 months we have a short “wish list”. It includes a new TV (ours is 8 years old and not very efficient), replacing our lighting with LED and replacing my ancient laptop which no longer has any kind of battery life and must be plugged in to use it. Our “money is no object” wish list would include more batteries, another panel (or two), replacing our inverter with a pure sinewave and installing a few 12v outlets (one in the kitchen and one in the bedroom for running things like a marine fan). Handy Bob’s Blog – much more technical but chocked full of information, especially useful for those who want to DIY. Bob also does remote installation is one of the few recommended installers in the business. AM Solar – arguable the leader in RV solar, you’ll find answers to many questions here. They are probably the most sought after installation company around and many a fulltimer make the trek to Eugene, Oregon just to get their system installed. We hope you find some value in this information and welcome your comments and questions. Please bear in mind that we aren’t experts and this was an area we didn’t feel comfortable doing ourselves but many, many others have done so successfully. There are several kinds of panels made by various manufactures…some cost less than others. The same can be said for inverters and every other part needed for the system to work. Since solar and electronic comparisons are not in our repertoire we cannot advise on which parts are better or cheaper. You may very well be able to find a better system for a cheaper price. If so, good for you! The main point being solar is fantastic addition for those wanting to get out in the wilds and away from the traditional RV parks and resorts. 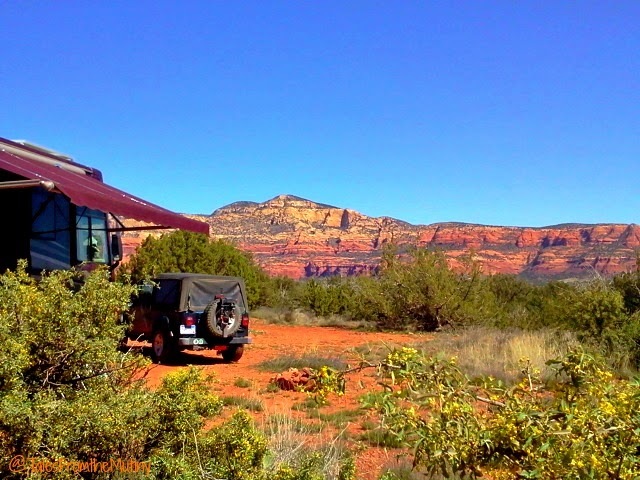 One of the fabulous…and FREE…places we’ve boondocked outside of Sedona. Glad the solar is working out so well for you! Very informative article. That you for that wonderful insight on how using solar power can improve one’s lifestyle on the road. 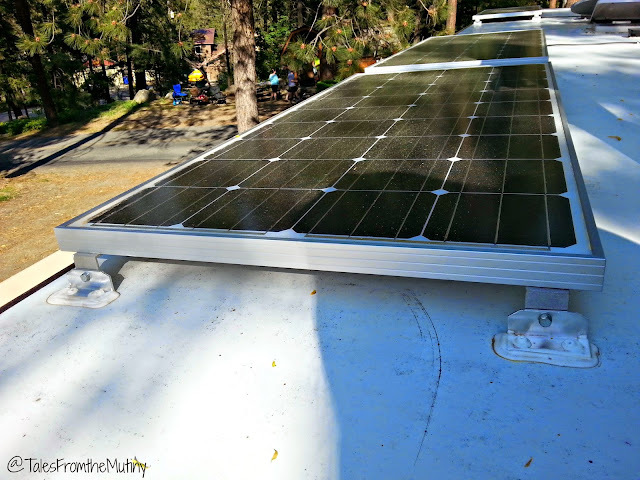 Hopefully, people who are also looking into adding solar to their RVs get the chance to read this, so that they could read about some first-hand information about the matter. At the very least, they’d have an estimate of how much it would cause, and more importantly, set realistic expectations about it. Cheers! Great article, Thanks for the helpful information. We still have a few years before we can travel as you do. We are currently workampers so solar is not needed yet. But I'm planning and saving for the day we can boondock. Too bad you can only put so many panels as what your RV’s roof can handle, but I think as long as they’re position nicely, you’ll be able to get as much juice from them as possible. Anyway, I hope there haven’t been any problems with regards to their maintenance and whatnot, and that you’re very satisfied with how they’re performing nowadays. Thanks for sharing! Douglas Berry @ Solar Energy Designs Inc.
Bookmarked this article – thank you for taking the time to post this information. You guys are super. Love your style of writing and your vivatious transparency. Thank you much!! Appreciate the comment Liza, and I agree…learning the realities of how things work is important. I miss out little nugget camper (sometimes). Thanks for stopping by…I hope you get to experience some boondocking in the future and that you get great joy from it. 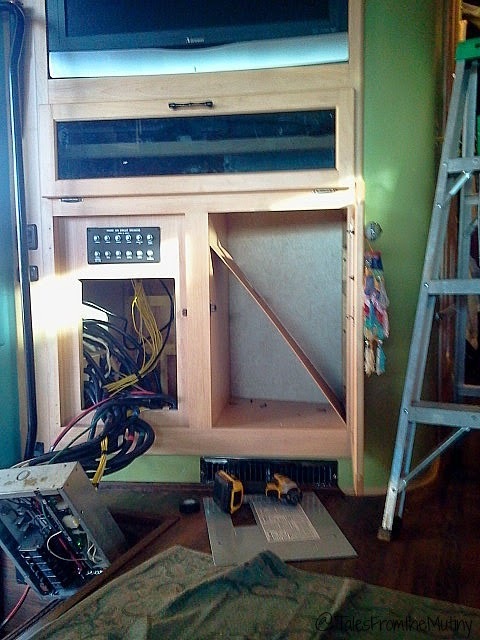 So far so good…the panels are very easy to clean and we've (knock on wood) had no issues with them. Still loving it all.